The industrial site on Val di Sangro crossed the finishing line with five million vehicles manufactured. The vehicle that helped reach the record is the new Ducato People Transport 130 Multijet II. 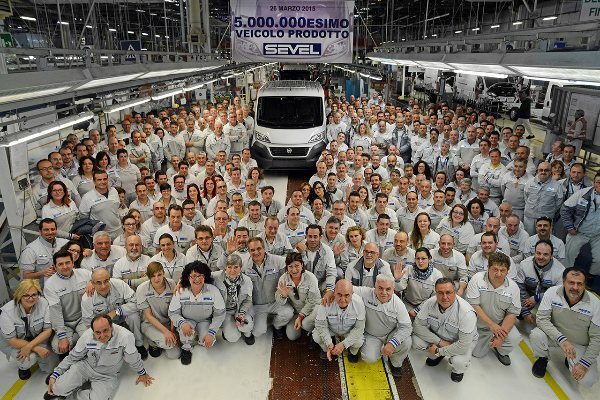 This reinforces the historical bond between the best seller Fiat Professional - 34 years of life, five generations and more than 2.6 million units sold - and the largest European factory manufacturing medium to large vans. Vehicle number 5,000,000 came out of Sevel's (European Light Vehicle Company) production lines. It is a Fiat Ducato People Transport , with white livery and equipped with the brilliant 2.3 Multijet II 130 HP. Acquired by an Italian client for passenger transportation, internally, the vehicle is characterized by a modern techno dashboard that combines soft touch materials with shiny black surfaces and rich chrome plating. The centre console integrates the exclusive UConnect radio system with 5" colour touch screen and CD/MP3 player, with Bluetooth technology, steering wheel commands and rear view camera. In addition, the interior comfort is guaranteed by the various seat adjustment options, both for driver and passengers, and by the efficient front and rear manual climate control system. Finally, safety is also guaranteed by the latest generation electronic stability control and by the "full size" 120 litres airbag for maximum passenger safety. Undoubtedly, the winning hand of Ducato People Transport is its reliable 130 HP turbo diesel Multijet II engine, which ensures excellent performance, agility in urban traffic and brilliance in long distance drives. Moreover, the high torque at low rpm (320 Nm at 1,800 rpm) allows the vehicle to "spring up" with ease, even with heavy loads. The engine thus proves to be the "best in class" in its category, the perfect balance between power, torque, by far the best in fuel consumption and autonomy compared to its competitors. This record-breaking model confirms the high versatility of the best seller Fiat Professional, which, for the last 34 years, with its 5 generations, has been the best travel and work companion for the over 2.6 million clients who have chosen it since 1981. Not to mention that more than 500,000 families still travel today with a Fiat Ducato-based camper, which has been the absolute leader in the sector for years and a benchmark in its class. Furthermore, in 2014, this model won the title of best-selling vehicle of its segment in Europe. Among this model's many strong points, its powerful and efficient engines as well as numerous high-tech contents, such as the last generation security and driver assistance systems and the new Infotainment system, are particularly worth mentioning. In addition, thanks to certain targeted technical interventions, the New Ducato's already excellent durability and strength qualities have been improved with a consequent increase of its residual value. All of that, combined with low operating costs and reduced spare parts prices, allows the new Fiat Professional vehicle to offer among the lowest maintenance and repair costs in this category, a key element contributing to improve the "Total Cost of Ownership". The Sevel industrial site is the largest European factory for the manufacturing of light commercial vehicles. The agreement that established the joint venture partnership between FCA and PSA-Peugeot Citroën was signed in 1978. The factory began working in 1981, manufacturing 350 vehicles per day. Subsequently, the site was expanded in order to support the production of a wider product range, up until reaching its current capacity of over 1,000 vehicles per day. Besides the New Fiat Ducato, two similar models are also manufactured for the PSA partner. The factory is located between the municipalities of Atessa and Paglieta, in the Chieti province, and occupies an area of more than one million and 200 thousand square metres (120 hectares), 344,000 of which are covered (34 hectares), and it is equipped for the entire production cycle: bodywork, painting and assembly. Currently, the factory employs 6,070 people (about 92% of whom reside in Abruzzo); 350 articulated trucks with materials come through its gates every day and 200 car carriers and 4 trains with assembled vehicles come out. And there is more: the Body shop manufactures about 300 different types of bodywork, Painting uses 208 colours and Assembly manufactures almost 10,000 versions and over 150 options. To confirm the car's appreciation by the market, in its 25 years of life, the factory has seen a steady growth of production, employment and investments. What's more, the system complies with the highest quality and environmental standards: the quality system has been ISO 9001 certified, while the environmental management system has achieved the ISO 14001 certification. And, since 2013, it is also certified in terms of energy management (ISO 50001). The new painting system is particularly interesting, as, both in terms of technology and respect for the environment, it is among the most advanced systems in Europe (as demonstrated by the application of water-based enamel). Inside the factory - about 330 metres long and 60 metres wide - there are about 150 people working per shift, and 32 robots that apply sealant and enamel. And then, there are the electroplating baths and the drying and firing furnaces. Fully automated. Employees are responsible only for monitoring the process and checking the result. The preparation of the surfaces to paint is also partially automated: it is performed by rollers made of feathers of anti-static material, particularly suitable because they don't electrify during friction. Unlike cars, the bodies of commercial vehicles are painted on the inside as well, because the surfaces of the "cargo" versions are visible. This is why, for each model, about 65 square metres of sheet must be covered: this requires 10 kg of enamel and 137 metres of sealant. 25 million metres of sealant are applied in one year - about 4 times the Earth's radius.